April 10, 2013 Bell Helicopter introduced the V-280 “Valor” tilt-rotor at the 2013 Army Aviation Association of America’s (AAAA) Annual Professional Forum and Exposition. The program is meant to develop a replacement for the UH-60 Black Hawk, AH-64 Apache, and CH-47 Chinook. Hopefully some day we may be able to fulfill the medium range search requirement with the same aircraft that provides the long range rescue capability, and this replacement for the H-60 will have twice the range and almost twice the speed of its predecessor. This entry was posted in Uncategorized and tagged Bell, Future Vertical Lift, FVL, Long Range Rescue, Medium Range Search, V-22, V-280 by Chuck Hill. Bookmark the permalink. We are going to need to replace the H-60s much sooner than that. The way were using the HH-60’s, I think we could replace them with Sikorsky CH-148 Cyclone that the Canadian Forces are getting or get their version called the AgustaWestland CH-149 Cormorant. Nicky, It might be a bit big. I am not sure how it compares in the rough stuff not being an air guy. But It’s an impressive copper CH-148. I have heard good things about the AgustaWestland CH-149 Cormorant that the Canadian Forces are using as their SAR helicopter. The AgustaWestland CH-149 Cormorant is actually a version of the AgustaWestland AW101 that the Royal Navy is using. The AgustaWestland CH-149 Cormorant would be perfect for Curtain AOR’s such as Alaska, Cape Cod, Florida and even Hawaii & Oregon. As for the Sikorsky CH-148 Cyclone, I know my father worked on it when he worked for Sikorsky and has told me that it was designed to land on a Canadian Destroyer and Frigate. It was designed to replace the famous CH-124 Sea King. What my father told me about the Sikorsky CH-148 Cyclone is designed as a replacement for the SH-3 Sea King and it’s variants. So to replace the HH-60’s I think the top 3 could be the Sikorsky CH-148 Cyclone, AgustaWestland CH-149 Cormorant or the NHIndustries NH90 helicopter in the NFR NATO Frigate helicopter version. Wow! That was the largest amount of cheese since a late ’80s industry promo! Say what you will about the predictable thumping soundtrack & gruff voiceover combo, showing as little variety as its closely related action movie trailer cousins; but at least they don’t have to rope in cheap-rate bit-part extras or worse still actual contractor staff (engineers playing actors playing soldiers *shudder* – dodged that bullet myself back in the day). CAPT: !!! ONE MINUTE !!! 1SG: Err Sir why are you shouting? They forgot to add internal cabin noise to this segment, so it’s as quiet as a tomb back here. CAPT: Shut-up and watch Powell fling open a cabin door at speed & altitude with just the fingers on one hand. CAPT: Top, in a twist unrelated to either the original story or showcasing a product capability, I’m taking half the force away on a FRAGO and leaving you here to clean up. Oh and I’m holding you fully responsible for getting them home safely. 1SG: Sir is this because I called you out on all the unnecessary shouting earlier? Powell: Sir you know, you’ve left the First Sergeant behind in hostile territory with just a rump force. So deep in fact, that we needed the new capabilities of a Valor just to get there. @Patrick @Nicky: Not withstanding the current UK SAR PFI competition win, that will add AW189 into the mix, but the CH-148 in its S-92 civilian guise has already entered service in the UK (HM) and Irish Coastguards for operations over the unforgiving North Atlantic. There have been no significant public revelations that would suggest any problems with its expected performance in the land-based SAR role. The South Korean CG should also be accepting theirs into service later this year. Apparently the Army has selected the Bell V-280 and they are saying first flight in 2017. It would almost double the speed of our existing helicopters. Chuck, I saw this today (http://money.cnn.com/news/newsfeeds/articles/prnewswire/CL24020.htm) and is got me thinking about the potential for the S-97 being a good size to be a possible replacement of the MH-65. Additionally, Sikorsky is supposed to be building a plussed up version of this to a Jayhawk sized aircraft, so this style platform has the potential for replacing the whole USCG rotor-wing fleet. Anyways, this tech seems like it could really be the future compared to all the tilt-rotor stuff out there. These are smaller, in overall size, not capacity, compared to the tilt rotor, they seem to be more maneuverable and just seem flexible enough for the USCG mission! That’s a very interesting and informative video. What caught my attention was that it says that the rotor wash from these would actually be less than a traditional helo. I wouldn’t have expected that. IF all they show in the video becomes reality, I think it would be a very strong option to look at. My only concern is that it looks drastically different than most of the helicopter market and I would hope that the looks don’t deter anyone. However, since it’s a Sikorsky project, I would think their reputation speaks for itself. As the link that Chuck showed, the Russians have been using the dual axis rotor system for a long time now. Prior to the S-97 Sikorsky played with a scaled down version called the X-2, here are two videos showing it in action, it is vary impressive! Will its height be able to fit in the hanger of the WMSL and future WMSM? Good question, Lyle. The Russian version of the Mistral LPD did have to raise the hangar height to make room for their helicopters. Still the X2 tech does not seem to be as tall, perhaps they are using rigid rotors. I’ve played with RC helicopters and those with coaxial contra-rotating rotors are easier to fly. These two videos were also worth a quick watch. I really do think this thing has potential, and in the Raider size, it seems like it would be a good 65 replacement! Thanks, David. The H-65s were introduced 30 years ago. They have been updated, but that is a long life for an airframe, and considering how long it takes for us to bring new systems on line, I would think we will have to start looking pretty soon. The H-60s came along 5-10 years later. Unless we plan on having 50 year old helicopters too. I don’t know Chuck, if there is anyone getting screwed worse than the USCG right now, it is the US Army. The current plan is for the Chinooks to be in service for a hundred years if you can believe it. David, those pics and video are awesome. They are still building new Chinooks. Sikorsky’s S-97 Raider, an experimental coaxial helicopter, cleared for full flight test program. Regarding the light version, which could be optionally manned. This post started in 2013 and added mention of the SB-1 in 2014. Now, in 2018, there is no joint program office (and therefore no signs of a combined-use system, like the H-60), and prototypes are not expected for another year or two *at the earliest* (granted technology demonstrators have been around for a long time). WWII lasted 3.5 years for the US and we developed, designed, produced, and deployed the atomic bomb in that time! The old engineering saying: “Fast, Good, Cheap; pick any two” comes to mind… It looks like we are getting only good in this program, with it turning slow and expensive! The Sikorski candidate and why it might be better. Well,I’ve been doing a lot of reading, and I predict the USCG will go it’s own way and buy something off the shelf. The Pentagon has been jacking around with this program longer than CG did Deepwater… There are a couple technology demonstrators and more work being done, and I’m sure both prototypes will go onward to see decent sales,,,,,,,, 10 or 15 years from now. However, everybody is saying “slow and steady wins the race,” which means these advancements will come far too long after the H-65 needs replaced, and possibly after the H-60s need to be gone. The tilt-rotor design seems to be very, incredibly, risky, both technologically and stability-wise in the environmental conditions the CG flys in. Even if it folds-and-stows like the V-22, it is likely going to be too large for current and proposed hangars on Cutters. Volume/capacity, range, and speed all are good, but the problems above seem pretty severe. The S-97 and SB-1 are very attractive. High stability, speed, range, maneuverability, cabin size, all good. But, the X-2 rotor system uses rigid rotors, so there will be no folding and stowing in hangars. Even the S-97 technology demonstrator at 34′ diameter rotor would be too wide to fit inside. It’s a shame, because speed is of the essence in SAR cases, but this a/c would be land-locked, unless tying down to the flight deck during all environments the Cutter & A/C sees is acceptable? My bet is the CG will follow the Navy’s path, which was to buy new-build H-60s. There may be other light/short-range rescue helos which would fill the bill for replacing the H-65s? I’d love to hear an airedale’s perspective. Any of those follow your blog, Chuck? And add folding rotors and a RAST and it will work at sea and I guarantee be FAR cheaper than the technological leap of either the V-280 or SB-1. 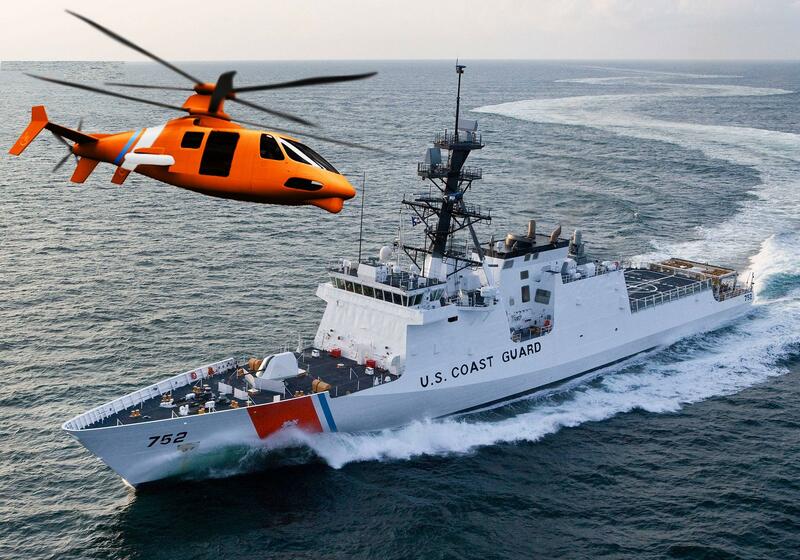 Bill, It would be reasonable to assume that the CG H-60s and H-65s would need to be replaced before the FVL aircraft are ready, but because the Coast Guard is doing life extension programs on both types, they will not be replaced until the 2030s. The Coast Guard is monitoring the FVL program, and is apparently planning on piggy backing on it. Video of a Sikorski prototype.